Railpictures.ca - Bill Thomson Photo: A view from the platforms of the old Canada Southern St. Thomas station one January day in 1973 shows westbound power posed by the station lead by Penn Central SD35 6008 and GP35 2304. A green PC vehicle is parked by the station, and behind in the distance is the old NYC-CPR freight house. Visible on the right beyond the cut of hoppers is PC’s St. Thomas locomotive shops (originally built in 1913 by the Michigan Central RR). Today all the rails have been removed, but the station and shop building remain. | Railpictures.ca – Canadian Railway Photography – photographie ferroviaire Canadienne. 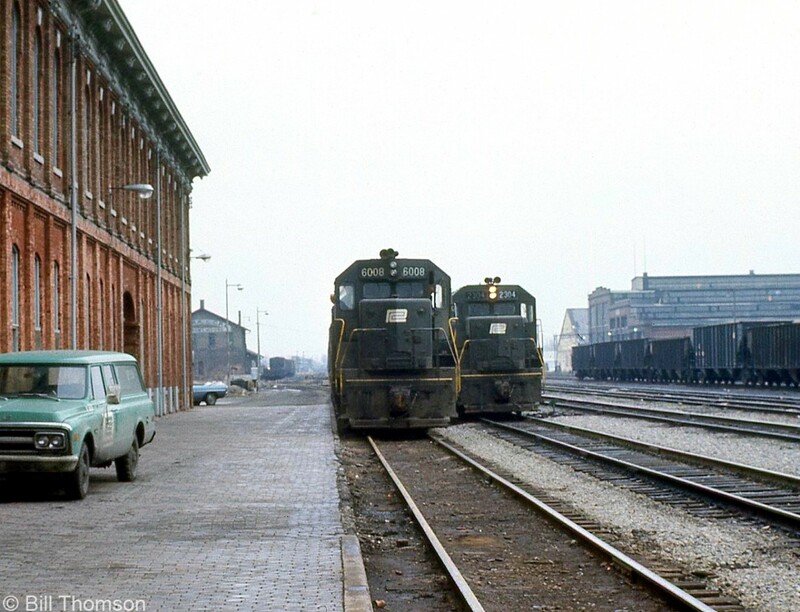 Caption: A view from the platforms of the old Canada Southern St. Thomas station one January day in 1973 shows westbound power posed by the station lead by Penn Central SD35 6008 and GP35 2304. A green PC vehicle is parked by the station, and behind in the distance is the old NYC-CPR freight house. Visible on the right beyond the cut of hoppers is PC's St. Thomas locomotive shops (originally built in 1913 by the Michigan Central RR). Today all the rails have been removed, but the station and shop buildings remain. It might be a photo from railroading’s dark days, but its a great one. Oh boy… when the CASO still had through freights!